This is a worksheet that students use in the computer lab. 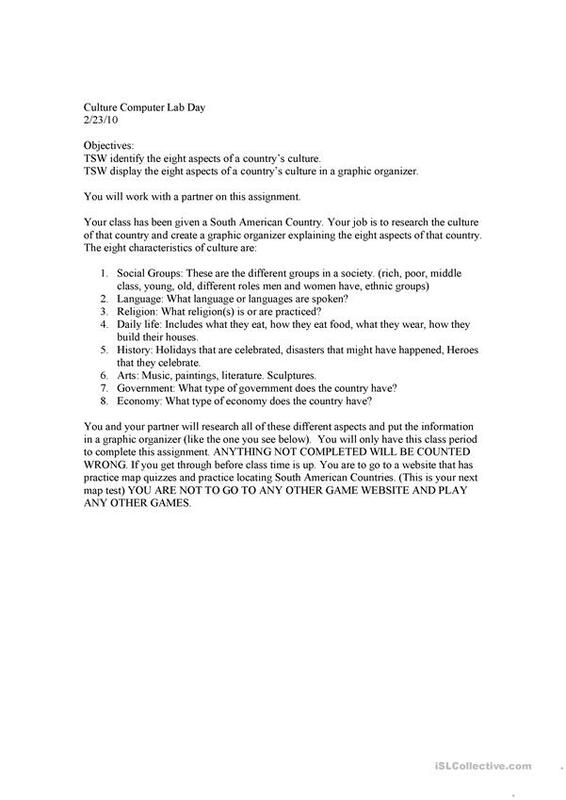 The students are required to use computer to research a country's culture. Students place their findings in a graphic organizer that shows the eight traits. The present downloadable worksheet is a great resource for high school students and elementary school students at Upper-intermediate (B2) level. It is useful for working on your students' Reading and Writing skills. It focuses on the theme of Countries. Moodyblue is from/lives in United States and has been a member of iSLCollective since 2012-04-05 22:40:15. Moodyblue last logged in on 2012-04-05 22:56:51, and has shared 1 resources on iSLCollective so far.